Honda hoped in 2000 to regain the top position. 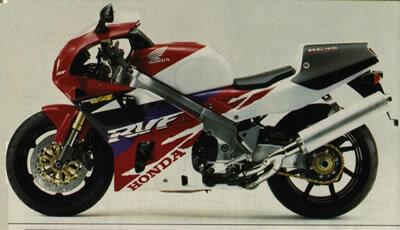 But Yamaha didn't sleep and also modernized its R1. The Fireblade again had to be satisfied with second place although the lead held by Yamaha was huge. The introduction of new CBR was in Spain on the Estoril circuit. The Fireblade almost qualified as sport touring bike. High power on the top of range disapeared, same as slightly unstable controllability. The new Fireblade finally got what needed long time ago - 17'' front wheel. This together with front fork /upside-down/ calm down the front part of the bike and subsequently allowed more hard manoeuvring. The Fireblade represended highly a sophisticated unit that could overcome the R1 but ... Yamaha didn't leave anything to the coincidence and for year 2000 also modernized its R1. The R1 lost 2 kg and got titanium exhaust muffler together with many improvements in engine and chassis. But the Fireblade also prepared itself well, it got an increased engine capacity from 918 on 929cc and decreased weight its weight to 170 kg. It also was given fuel injection. Honda finally increased power - it reached at least on the paper 152 HP, but was proven it was too optimistic - checks on dyno showed more realistic value about 135 HP.